A) Sturdy support in all directions..back, foward, left and right. B) Supports the banjo with no weight on the resonator.. A perfect stand would cradle the bluegrass banjo on the sturdiest component or the body. 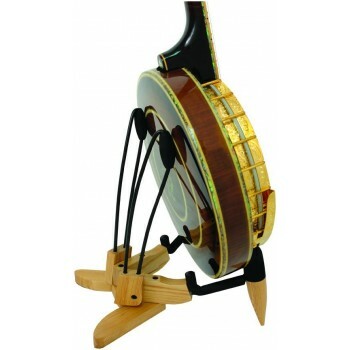 Our BBS cradles the banjo body.. with no chance of the selected cushioning materials marring the finish. D) Lightweight and compactable. folds completely and is easily carried. E) Looks very cool...Hard rock maple wood (clear finish) with black metal supports.